"AP reports that Federal law enforcement officials in Alaska U.S are investigating after a 48-foot female whale well-known in the waters of southeast Alaska was killed in a collision with a boat. nearly 40 years, near Funter Bay on July 1. The carcass was hauled to a nearby beach, where a necropsy was performed July 3, officials said Friday". "The left mandible was fractured and the right mandible was traumatically dislocated from the cranium," Dr. Kathy Burek of Alaska Veterinary Pathology Services, the lead veterinarian on the necropsy, said in a statement Friday. "Cause of death was determined to be ship strike." During the necropsy, tissue and organ samples were collected, including stomach contents. National Oceanic and Atmospheric Administration officials said analysis of the eye and ear plug should be able to determine the whale's age. The whale has been known by several names, including Max, Aequorea or No. 539. It was first documented in Glacier Bay, near Juneau, in 1975. Records indicate she had at least five calves between 1982 and 2005. Her offspring have produced at least three other calves, officials said. The whale was regularly seen in both Glacier Bay National Park and Preserve and Icy Strait. The last documented sighting was two years ago. Whales are distinguished by their distinctively pigmented tails. 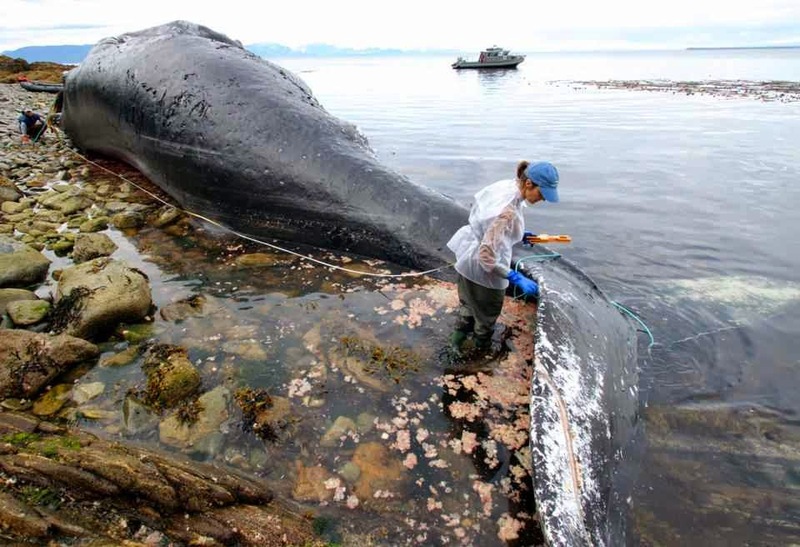 The whale's death serves as a reminder for ocean users to slow down and be careful, said Aleria Jensen, NOAA Fisheries Alaska Region marine mammal stranding coordinator. "With a recovering population, we are seeing more and more humpback whales every year. This is a reminder to take extra precaution when whales are in the area and slow your vessel's speed. It's the number one action to take to prevent ship strike," Jensen said. There were 108 collisions between boats and whales in Alaska waters from 1978-2011. Most of the boats involved were small vessels. A third of the collisions resulted in human injury or property damage. Many people were thrown into the water after the strike.